You can set the value of the Effect property for any control deriving from UIElement. An effect is a two-dimensional graphical effect applied to the control when it is rendered. 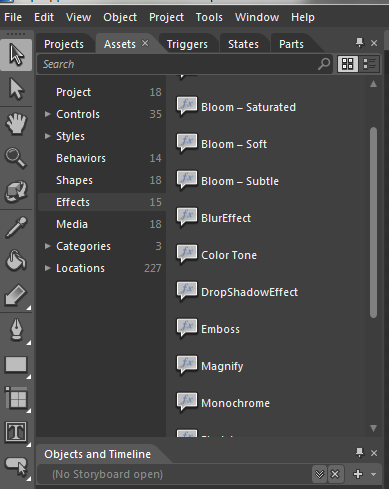 To apply an effect to a control in Blend, start by left-clicking on the Effects folder in the Assets panel. The .NET Framework comes with two pre-defined effects, located in PresentationCore–BlurEffect and DropShadowEffect. (The other effects shown above come from the Expression SDK for .NET 4). You can drag either of these effects onto a control on the artboard, or a control listed in the Objects and Timeline panel. <Label Content="Drop Shadow Effect" FontFamily="Cooper Black" FontSize="48"
<Label Content="Blur Effect" FontFamily="Cooper Black" FontSize="48"